Here is a list I am thinking of testing out this week, and possibly taking to the Locara Tourney in February. 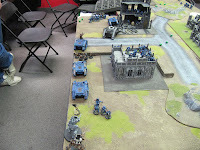 The idea is the large noise marine unit gets the land raider as their ride, and both it, the CSM in rhino, and vindicator all go 12" up the board at the start - or toward objectives. 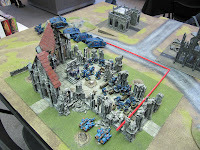 That leave the 5 man with blastmaster hanging back as fire support, and possible the Oblits as well. 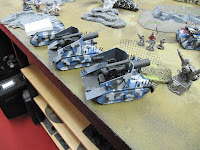 I think it's essential to up the Oblit unit to 3 to allow for reliable ranged anti-tank/anti-infantry. They could also deep strike off the personal icon of the noise marine champion if the scenario calls for it. This list ups my melta gun content, and adds a much needed power fist to the 2nd assault unit. These will prove indispensable against monstrous creature and walkers. Notice I added melta bombs to the other squad, to help with vehicles/walkers in a pinch. 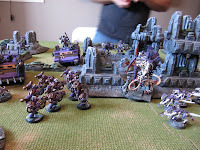 Another option would be to drop the deamons and 3rd oblit, and take another CSM squad. I don't have one painted though, so its a tough call. 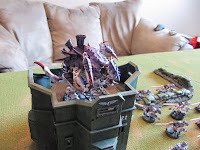 That slot could also be taken by a roughly 8 man raptor squad with Mark of Slaanesh too, so who knows. 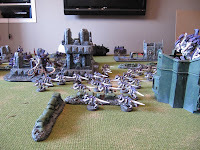 I think I will try this list to start, because few people remember that deamons are scoring units....and having them arrive turn 3/4, go straight into assault (supported by noise marines) may allow them to be in a position to capture an objective late game. I also pulled the Termies, as they seem expensive for their return in 1500pts. Only testing will tell. 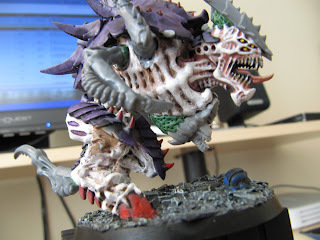 Stay tuned for pics of my now painted Land Raider, and WIP shots of my deamons and Deamon Prince. Basically, it overlays digital content on live items. 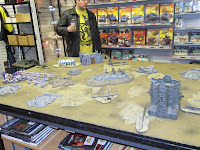 Think of the possibilities with GW, and table top gaming over-all. Is it a good thing or bad thing? Will it catch on or is it just a gimmick? Only time will tell, but I suppose it was inevitable. 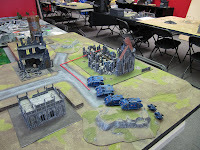 Please post your comments and thoughts below, as this seems to be a concept that may be creeping into our hobby world sooner than we think. Spent some time with the New Codex roday.. So, I was down at bayshore running errands, and then to paint my tervigons for a bit, when lo and behold: the new Tyranids Codex shows up. Few things that are different from my summary list, apart from name changes.. Tyrant Pyschic powers are shooting powers, so cannot be used if you run. So cannot move, cast, then run forward. Dont know if this will influence my weapon choice for y Tyrant.. which so far has been scything talons, since Inever DID get around to putting the heavy VC back on... Another change/clarification is that Paroxysm cannot lower WS and BS to 1 on vehicles. So what I pulled on Lothlann's Vendetta crew, I can no longer do. Thirdly, troop mycetic landing spores do not score. Tyrant, scything talons, lashwhip bonesword, Tactical Insight, or w/e the power that gives +1 to reserve rolls. 195 points. I am now at 1216 points. Do I add another tervigon>? 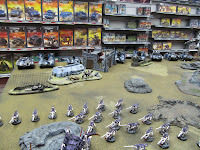 thats 175 more, leaving 100 points left over for something.. problem is, my troops would be full, since the 20 termagants would have to be split in 2, what would i take for 105 points? Decisions decisions.. note the lack of mawloc/trygon. I feel with this current build, I have plenty of in your face reserve things with 3 units of outflanking stealers plus the tank busting zoey's. I also felt that Hive Guard, 3 was overkill if I was shooting at only one rhino.. so lowered to 2 only, plus it keeps em 100 points of cheapness. 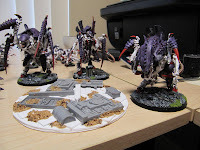 Well, third bat rep here.. My second time using the new Tyranids (again, the codex isnt out yet, so Im using the leaked summary) and same list vs Ca$h's Emperors Children. I filmed this on my new camera, but it turns out that the battery was low, and also each pre turn snippet was 160 megs, so I need to plan out the video taking a bit better for next game. Cash Deploys obliterators across from my Tyrant, and then moves up, lashing my termagants back in turn one. After the shooting he had to assault, since he knew I was going to charge him. 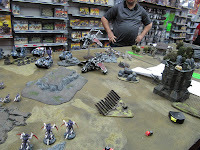 Tyrant typically fails to do many wounds..
Now at this point my camera died, but my Hive Guard came on right behind the ruins in the foreground of the above pic, and shot at the rhino, and did nothing. My large brood of termagants moved up and helped the Tyrant out in combat, doing the wounds needed to wipe out the noise marines. My Genestealers outflank left and right, taking out a 5 man noise marine squad on his objective on the left, while on the right they charged a vindicator, and were then destroyed by his terminators. 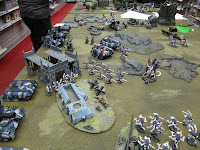 At this point of the game, with Zoanthropes and genestealers still incoming, it looked grim for Cash, and I was feeling very under-the-weather, so we called it there. 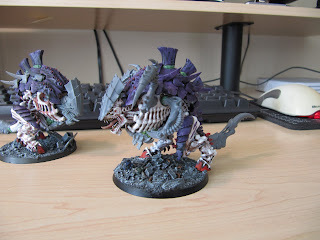 Thoughts regarding new Tyranids. At first Lothlann and I discussed the spore mine's ability to prevent the enemy from deploying in his own DZ in dawn of war missions, but in 2 games so far, havent even proven to be a nuisance. Luckily the do not give up KPs. So I'll probbaly ditch them. In 2 games, the Mawloc wasnt up to snuff. 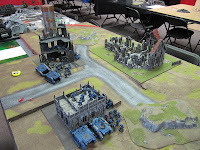 Sure on paper its ability to come from underground and do str 6 ap2 hits is good, but thats if it doesnt scatter.. Against Loth, I stunned a manticore, then got plasma gunned, and vs Cash, it scattered off the Oblits, and would have been shot to death by them plus the land raider plus terminators. Hive guard. Again 6 str 8 no los shots are good, but they seem to be best vs vehcile squadrons, and I think 3 is overkill.. I might go with just 2. Zoantrhopes.. they still havent had a chance to drop and kill a Raider, as in my game vs Cash, they never came in, so verdict is still out on them for me. Termagants/Tervigon: So far they are stars of the show, as the enemy needs to deal with them. I dont even have poison attacks on the Tervigon to pass along to the Gants.. So, I am thinking of building a Tyrranofex with my Trygon kit. yeah its 265 points, but can kill vehicles turn one.. rather than waiting for turn 2 if I'm lucky for zoan's to come down and roast a Raider. if its by turn 2.. that means he has already driven forward 12 and popped smoke. 265 points while expensive, can put the shots on turn one, and can advance while doing so, and hopefully soak up some firepower that right now, frankly, my Tervigon is eating up. 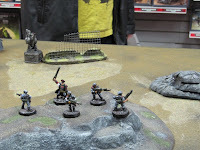 Here is a quick rep of a battle at bayshore Jan 4th vs Lothlann's Guard. 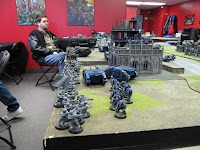 Dawn of War, Capture and Control. I used the list from previous posts, adding in 30 points of spore mines, leaving off Venom Cannon on the Tyrant. His turn one, I was facing this: 2x Medusa squadron, Squadron of 1x Medusa, 1x Griffon, Chimera, Manticore, 2 Hellhounds AND 2 Vendettas. Thank god first turn was night fight.. though he used on vendetta to searchlight my Tervigon and did 3 wounds to it, 2 wounds to the tyrant. Note to self: vs pie plates, spread them out a bit, otherwise he gets wounds on both with each hit or lucky scatter! 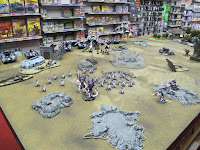 Turn 2/3 the Hive Guard (Warriors in foreground) walk on and destroy a Vendetta, and a lucky unit of Genestealers fleets, then charges the griff-medusa squadron AND the chimera in a nice multicharge, blowing all 3 up! I move spawned termagants forward to try and take the Defence Laser objective. 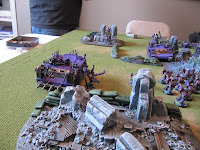 Medusas kill off the Tervigon, which I had moved back so it didnt kill my termies.. 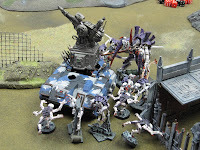 Turns 4-5: Veteran squad takes the Flak gun objective, and I deepstrike my Zoanthropes to contest, since my other Genestealers looked to be out of reach. 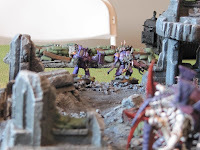 Close up of Lothlann's excellent medusa conversions.. and at the end of turn 5, a Tyrant and 7 genestealers FAIL to blow up a gun-less hellhound contesting the Defence Laser.. weak. Draw game. 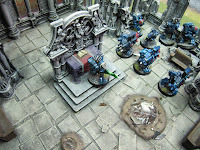 He fires his basilisks into the church area, hoping to kill many, but he got very unlucky with scatters, and his Russ was the only thing that caused any wounds. 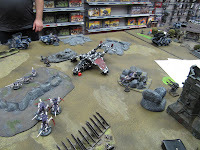 Also, my librarian is busy checking out the new Dark Eldar Codex... he it MIGHT be out by the year 30k! Wow, so finally finished one Tervigon, while the second one awaits my Trygon kit for arms. I used some Trygon parts, thanks to Kairos and Jay MG for their spares. Note that you can still make full functioning Mawlocs AND tervigons by going this route. Ok, this list assumes I can get the models in time, paint them, and find a suitable model to make a landing spore. At this point I am at 1316 points, which I could spend 170 points on a Mawlock, just because the model is kickass, plusit comes out of the ground for that "OH CRAP" moment for my opponent, or i round out my 6th troops choice with a brood of 5 warriors, 4 with devourers, 1 with barbed strangler, for 165 points to bring me to 1500. The warriors I can field right now, so I guess if I cant get the mawlock done in time determines what I bring to a certain extent. Assuming I go with Mawlock, model count is 3 monstrous creatures, 5 medium creatures, 60 small creatures, + whatever the Tervigon creates. pretty scary for 1500 points I'd say, and I'm not spamming anything either, unless I get lucky with the Tervigon. 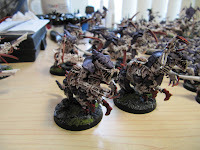 Ok, so I have a pretty good idea of what is coming down the pike for the Tyranids now, time to look at a few lists. In general, some troops have gone down in cost, while the larger stuff has definitely increased in cost. Hive Tyrant with scything talons, bonesword, whip. he is base 170 now, but this includes things you had to pay for before, namely ws and str, but to give him 2+ save is another 40. I have 3 broods of 12 genestealers. 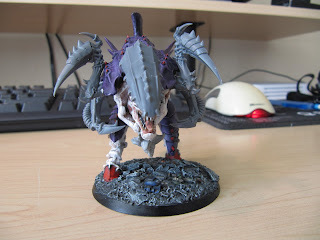 I have 1 broodlord in my old list, so will include it in one of the broods. They have gotten cheaper, broodlord can now fleet, yay, but lose scuttlers, gain infiltrate. 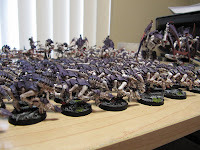 Had one squad of termagants without number for holding my back field, will include here.. these got cheaper, and ironically, made spinefists cost more!! sure glad all my gants are termagants. Lets see: 1206 points. So I lost 44 points, but also lost 3 x toxic miasma on carnifexes and hive tyrant, lost 2+ save on carnifexes, gained regen on them, gained WS. 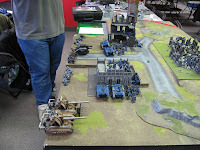 Next up, what Id like to take for 1500 points in the new book..
Well this is what sits on front of me. My newly acquired fleet for my 23rd Elysian Drop Troops. Assembled I have 2 Valkyries/Vendettas and almost a Vulture. 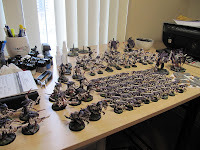 Also I have a few dozen unassembled Elysians there as well to join my horde (100+) of assembled and painted guys. Cheers for now and wish me luck.